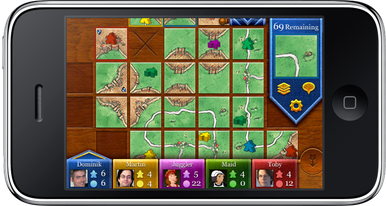 Pleased to announce that in month of May will be released the worthy tile-based German game Carcassonne for iPhone and iPod Touch. 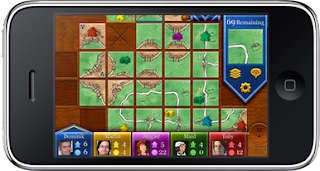 Carcassonne is now under production by Hans im Glück and developers of The Coding Monkeys. The game gives you various opportunities. If you like walled French cities and farming the app is primarily for you. Here you are able to lay out farms, cities and populate them. The app includes: multiplayer via Wi-Fi or Bluetooth, and Internet play. Besides, there are eight different AI opponents with differing strategies, including the Count and Countess, Maid and Servant, Juggler and Fortune Teller, and Witch and Warlock. The price of the game for iPhone version will be $5 (USD). Additionally the iPad version will be Universal app, that means if you're buying the iPhone version then you're getting iPad update for free. After that's out the price for iPad will rise to $10 (USD). Be careful don't miss it out!